Brain is the fisher while you -- a faceless, depressed human with only a distinctive sad face are the bait. It starts with you diving into the sea with a constant force pulling you down. It could be you or it could be the brain. Is there any difference? What matters is that you're controlling that part of yourself who needs to stop the fall before you hit the rock bottom -- literally in this case. Wanted to make a simple game composed of disparate mechanics that are tied only thematically and by player's common purpose. "Into The Black" is basically a light/dark based horror with psychological elements. You have taken a dive into your depressed mind(the ocean) and are constantly being pushed downwards by your brain(the fisher). Negate the downward force and find light in the darkness before it's too late. Find ways to reduce the constant force pushing you down in the pitch darkness of your mind before you hit the rock bottom. There will be ways to increase it and ways to decrease it. The above image explains it quite well. You move your mouse around but initially only a small part of the screen(the inside of your mind) is lit. Everything else is pitch black. Your mind's insecurities (better called as "MIND") spawn randomly in the darkness. A "happy person" will spawn all colourful and surrounded by light speaking words of positivity but meanwhile slowly but steadily moving towards the mind. It's basically a race of who reaches there first. The twist is you cannot see the mind hidden in darkness. -- Chains get anchored to your feet and drag you down with an increase in force. (of the mind). On top of all this, there are the above-mentionedjellyfish-like creatures who constantly move towards you -- taunting you. This is basically the part of your own mind you need to stay far from. If you come in contact with them, you freeze/become numb for a few seconds, thus putting you at a disadvantage in racing first to the "Mind"
Last edited by lightnarcissus on Sat Jun 01, 2013 6:22 pm, edited 5 times in total. Been working whenever I could find time in between my finals. Made decent progress thus far, though this being only my second game (first one being in the recent Ludum Dare) me working is 60% learning and 40% doing actual work. Regardless, the game's concept has evolved a bit since then focusing more on physics and light/dark elements but the core remains the same. --Your objective still remains to negate the downward force your mind is pulling you into before you hit the ocean floor/rock bottom. --The twist is that now there's a light/dark element. You get increasingly isolated by a light centered on you with everything around you being pitch black. -- Your depressed mind is now being pulled down into the ocean/mind by heavy steel balls. These balls automatically get clamped to your feet and drag you down like an anchor with an increased force. 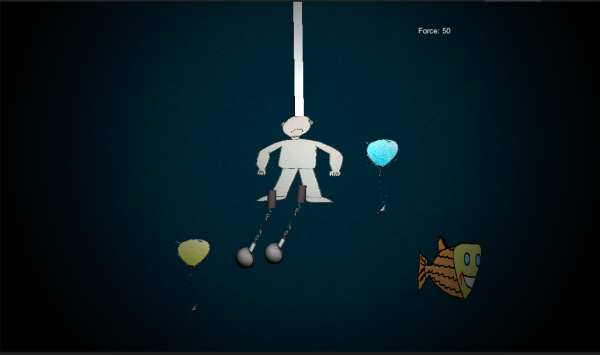 -- You counter them by hanging onto balloons. More balloons = greater decrease in downward force. More balloons also increase the light around you enabling you to see things -- the dangers and randomized events taking place in the ocean/mind more easily. Kinda shows the light/dark mechanic. Try not laughing at the art. I hadn't drawn properly in ages before this. Last edited by lightnarcissus on Sat Jun 01, 2013 1:05 pm, edited 2 times in total. Started producing music last night along with some voice clips. This is a rough demo of the background music from the game. Done entirely in FL Studio and I took a more minimal, no-keys, ambient track approach with this one. Also, recorded some voice clips on my own. To give it a creepy edge, I thought I'd use the vocoder plugin but it didn't turn out good. So, instead simple timestretch and pitch shifting gave me the desired results. Like I said above, I have poor drawing skills and was sorely out of practice, so I knew I wouldn't be able to draw in a normal "beautiful" manner, so I did few unique twists in the form of art style. -- Everything above is sunny and colourful. You are the only one who is colourless. -- Only one background track running while you're in the ocean. There's a SoundCloud link in the above post to a slightly different mix I did before changing it to a more ambient form. -- My voice. Initially thought I'd use a vocoder to make them sound intentionally creepy and unsettling but instead I used simple timestretch and pitch-shifting to make them sound like they turned out. A 5-minute demonstration video is up on YouTube. Have a look if you are not quite sure if you want to play this. Although, if you ask me, the video doesn't quite do justice to it.